Theresa May has been urged to stick to the government's timetable for having a vote on Heathrow expansion.A number of business lobby groups have signed a letter saying the government needs to "get on with expanding the UK's airport capacity".The BBC understands that the idea for the letter came from Heathrow itself.Transport Secretary Chris Grayling has also been asking business groups to support the expansion plans, the BBC has learned.The business organisations that signed the letter have all come out in favour of Heathrow expansion in the past. The letter sent to Number 10 said: "As Brexit approaches, Heathrow expansion is crucial to making sure the UK remains an outward-looking trading nation and is well-equipped to compete on the world stage. "For British businesses, the benefits of expansion have always been clear: connections to new markets and trading opportunities, with better links with regional airports across the UK a boost to British exports, and a skills legacy for future generations. 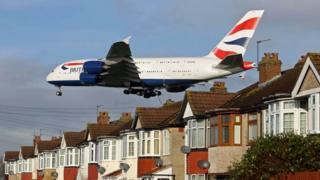 "The letter adds that the UK is losing ground to competition from European airports. "There are many unknowns for businesses surrounding Britain's future trading arrangements, but what is absolutely certain is that our economic success depends on securing Heathrow's future as a leading international airport," it adds.The groups that put their name to the letter were the Confederation of British Industry, the British Chambers of Commerce, the Institute of Directors, the Federation of Small Businesses, the EEF - The Manufacturers' Organisation, the London Chamber of Commerce and Industry, and airport expansion lobby group London First. The BBC understands that these organisations were asked by Heathrow to lobby the government collectively via the letter.The timing of the letter, which has been published by Heathrow, is particularly important.The government is due to timetable a vote on the Airports National Policy Statement, which is going to set out its airport infrastructure policy - including Heathrow expansion - in the first half of the year.Heathrow regularly has meetings with the business lobby groups, and its position is that the groups sent the letter out of a mutual desire to get the vote tabled, the BBC understands.It was expected that the vote would happen before the summer recess, which runs from 24 July to 4 September.The business lobby groups and Heathrow want the vote to go ahead as planned before September because then MPs will be more pre-occupied with Brexit.The terms for Britain to leave the EU need to be concluded by 30 September 2018 under a timetable set by the EU's chief negotiator Michel Barnier. The UK vote on the Airports National Policy Statement will be tabled after a process is set in motion by Transport Secretary Chris Grayling.He in turn has been lobbying business groups for support for the government's Heathrow expansion plans to try to get MPs to vote in favour.Conservative MPs are likely to vote with the government. Unions and many Labour MPs also support expansion, but the Labour leadership in the past has come out against Heathrow expansion on environmental grounds.